Meanwhile, the passengers had to face a tough time during the breakdown. 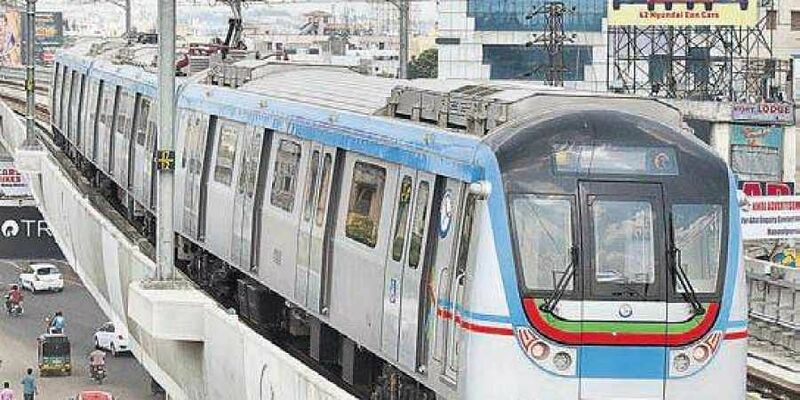 HYDERABAD: Hyderabad Metro Rail passengers witnessed tense moments on Saturday morning as the services were disrupted for around two hours on Moosapet-Miyapur section due to a ‘catenary OHE parting’ in the section. Services were operated in single line in degraded mode, after which the services were restored in both lines around 1.20 pm. An inquiry is ordered into the incident. This is the third time the Metro rail services were disrupted due to various reasons. “Metro services were disrupted on Moosapet-Miyapur section between 0957 and 1140 hrs due to catenary OHE parting in the section. At 1140 hrs, single line working was implemented and services were restored between Moosapet to Miyapur in degraded mode. Maintenance team was mobilised to site along with Catenary Maintenance Vehicle (CMV). The restoration was completed and normal services resumed at 1320 hrs. The cause of failure is being investigated. Inconvenience is regretted.” the HMRL said in an official release. Meanwhile, the passengers had to face a tough time during the breakdown. A few passengers alleged that there were no information about the delay on the services and the staff were also clueless on the issue. The passengers alleged that the staff at the Metro stations did not inform them about the snag and continued issuing tickets. However, when the passengers protested after knowing about the disruption, the ticket amounts were refunded. Earlier in May, Metro Rail services were disrupted for about half an hour on the Ameerpet-Miyapur section, when an advertisement flexi banner fell on the overhead electric wires. Strong winds measuring up to 78 kmph dislodged the banner which landed on the wires at JNTU-Kukatpally. On another occasion, services between Ameerpet and Nagole were halted for a while after advertisement banners fell on power cables.